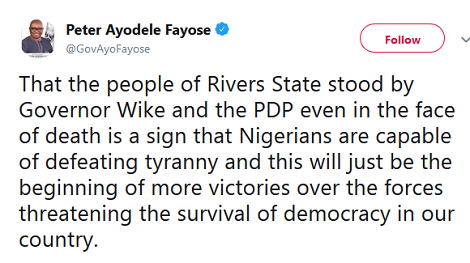 Former Governor of Ekiti State, Ayodele Fayose has hailed the Rivers people for standing by Governor Nyesom Wike and the PDP during the course of the elections in the state. 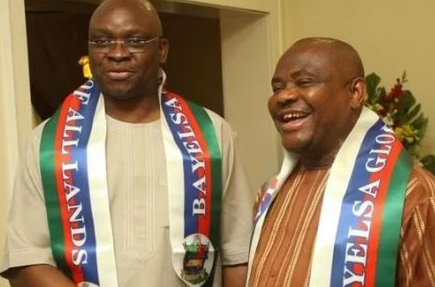 Reacting to Wike’s re-election, Fayose described the governor’s victory as sweet and historic. 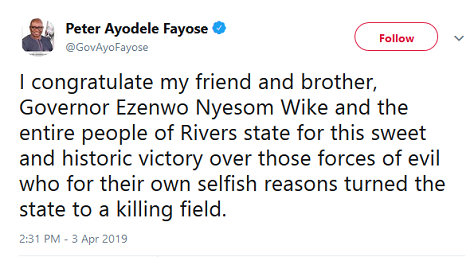 In a series of tweets made on Wednesday, Fayose argued that to have the people of Rivers State stand by Governor Wike and the PDP even in the face of death is a sign that Nigerians are capable of defeating tyranny. 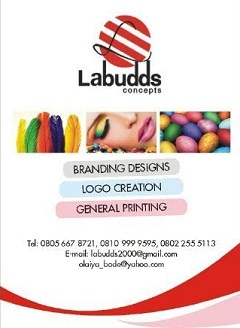 Fayose noted that the victory is just the beginning of more victories over the forces threatening the survival of democracy in Nigeria.